The highlight of the school year for international students is the annual Language & Culture Day. Students put great effort into preparing their displays, posters and presentations. All first-year students get the opportunity to meet the international students and learn about their diverse home languages and countries. They gain an insight into the rich and vibrant cultural and linguistic mosaic that characterises our school environment. Observing the different alphabets, sampling beginner lessons in many different languages is an inspiring experience for the Irish students. Last years International Language & Culture Day at MEC was a great success. Students from many countries shared videos, posters, projects, beginner language lessons, and food dishes with students from each first-year class. It was a vibrant and colourful celebration of the language and cultural diversity at MEC. International students at M.E.C. hosted a special lunch in school on 9th December. Guests of honour were a group of Syrian students from St. Paul’s secondary school, Monasterevin. They were welcomed to the school by Syrian students attending M.E.C. and by the many international students who took part in Language & Culture Day in November. The lunch menu comprised a vast range of dishes from many different countries, prepared by the international students and their families. Well done to all involved for the warm welcome and sumptuous dishes offered to our visitors from Monasterevin. Special thanks also to our past students Ciana Curley, Meadhbh Nelson, Charlie Harding and Adam Czubak who returned to school to help. Congratulations to 5th year student Emma Keane who will receive an Irish Translators and Interpreters award on the 14th of October, 2017. Her translation of the excerpt from the story "Geschichte vom goldenen Taler" by Hans Fallada is the winning entry for German in the 2017 ITIA competition. Well done Emma! Congratulations to Alex Harding, a Transition Year student, who was The Léargas Language Learner at second level for 2016. Alex received his award at Farmleigh House in Dublin on 30th September. The award recognise exceptional achievements in language learning. Congratulations and well done to Elena Giardini and Alexander Harding, both students at Maynooth Post Primary School, who were the two of only three national winners of the I.T.I.A. (Irish Translators’ and Interpreters’ Association) translation competition in Italian and Spanish. Elena and Alexander received their awards at a Gala Dinner for delegates from the International Federation of Translators which took place recently at the Clarion Hotel, Liffey Valley, Dublin. The judges praised the exceptionally high quality of the translations of these two young linguists, who were both Third Year students at the time of submission of the translation texts in May, 2016. Congratulations to Nicole Manalaysay, Alex Harding and Elena Giardini, Transition Year students at Maynooth Post Primary School, who came second in the EU Council Model Debate which took place on 10th March in the Printworks Conference Centre in Dublin Castle. The Model Council of the European Union is an annual debate organised by the European Commission. Its purpose is to encourage students to engage with the EU and its institutions and to become informed about EU priorities, policies and decision-making processes. 28 schools from across Ireland represented the 28 EU Member States. The Maynooth Post Primary students represented Malta. The debate theme was EU Trade Agreements. Students were expected to have thoroughly researched EU trade policy and to be sufficiently well informed to debate in detail the impact of new trade agreements on their respective country and the wider EU community. Proficiency in the language of instruction is a vital condition for educational success. The Language Support programme at MPPS will endeavour to meet the needs of EAL learners so that they can acquire the knowledge and skills necessary to become proficient users of English. EAL students will also be encouraged and supported to maintain a dynamic connection to their own language and culture throughout their school life. We strive to create an intercultural learning environment in our school where diversity is valued, supported and affirmed. In addition to language support, the programme is designed to help international students adjust to life in a new environment. We organise excursions to places of historical and cultural interest. We invite students to represent their home countries and languages on International Language & Culture Day. We host an International Lunch event each year and invite special guests to attend. We also encourage students to build up their language skills by participating in debates, translation competitions and international projects. In January, a group of Arabic-speaking students from MEC, accompanied by EAL teacher Ms. English, invited Syrian students from St. Paul’s secondary school in Monasterevin, to join them on a cultural trip to Kilkenny Castle and Kilkenny city. The St. Paul’s students were accompanied by their EAL teacher Aoife Comerford. The group had met previously at an international lunch hosted by international students at MEC in December. The trip to Kilkenny gave the students a chance to catch up together and to share their stories of migration and settlement in Ireland. Each year we encourage our students to apply their language skills by participating in translation competitions. In November, each year students have the opportunity to test their skill as translators in the Juvenes Translatores competition organised by the European Commission. The Commission's Directorate-General for Translation has been organising the Juvenes Translatores (Latin for ‘young translators') contest every year since 2007. Its aim is to promote language learning in schools and give young people a taste of what it is like to be a translator. It is open to 17-year-old secondary school students and takes place at the same time in all selected schools across the EU. Students may choose to translate from and into any of the 24 official languages of the EU. The contest has inspired and encouraged some of the participants to pursue their languages at university level and to become professional translators. The challenge for students is to aim to produce a high quality translation that should have the same impact on the reader as the original text. One winner is selected from each of the EU member states and the prize-giving ceremony takes place in Brussels. 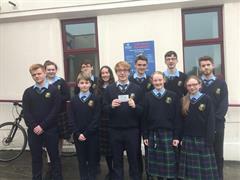 Later in the school year, the Irish Translators’ Association of Ireland offers students in secondary school another opportunity to apply their language skills. Students are invited to translate an excerpt from a novel or short story from any one of the following languages into English: Chinese, French, German, Irish, Italian, Japanese or Spanish.